In recent years, lexical argument structure, in the guise of thematic roles, has come to play an increasingly important part in syntactic theory. The first part of this book, first published in 1990, explores the interplay between thematic role assignment and movement processes, with particular reference to the explanatory problem of nominalisation. The second part explores the relationship between thematic roles and control. Particularly close attention is paid to implicit arguments, arbitrary control and adverbs of quantification. A theory of control is presented which unifies obligatory and non-obligatory control. The theory of control, furthermore, generalises to account for the binding gaps in purposive clauses, tough movement constructions, infinitival clauses and other constructions which have typically been analysed as involving long-distance dependencies. This title will be of interest to students of linguistics. This set reissues 22 books on syntax, originally published between 1971 and 1994. 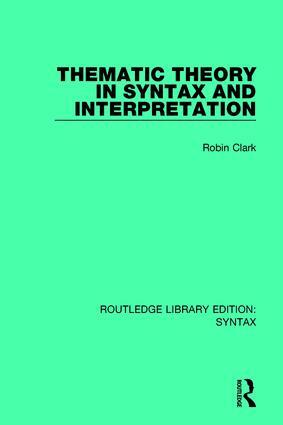 Together, the volumes cover key topics within the larger subject of syntax, including reflexivization, morphology and syntactical theory. Written by an international set of scholars, particular volumes focus on languages such as French and Spanish, whilst other volumes are devoted specifically to syntax in the English language. This collection provides insight and perspective on various elements of syntax over a period of over 20 years and demonstrates its enduring importance as a field of research.